Thanksgiving at Home | eat. write. smile. Is there anything better than Thanksgiving at home? 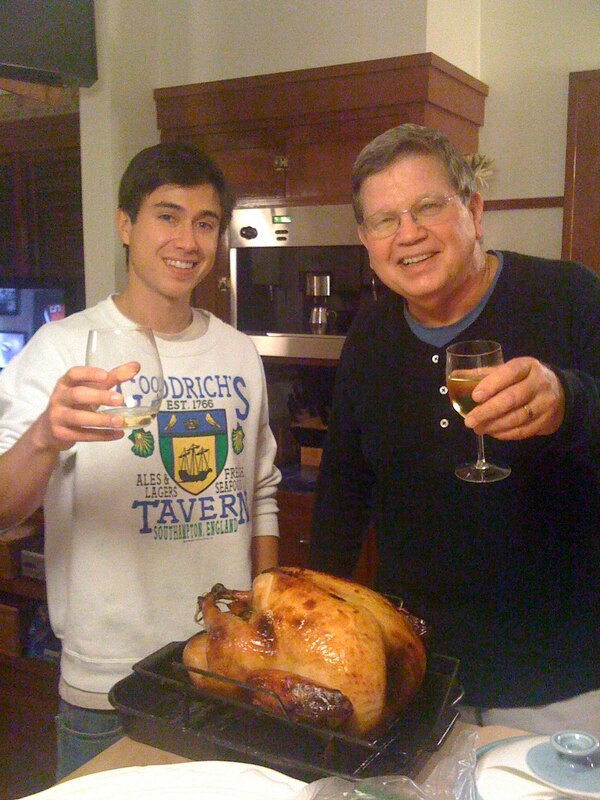 I have never celebrated Thanksgiving anywhere but my parents house in Palo Alto, 26 years straight. I suppose the day will come when that will change (as it did this year for my older brother Ben whom we missed very much), and I will be very sad to have to skip this divine meal. 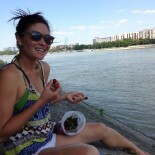 Luckily this year I did come home, and we feasted in fine form. I’m probably more than a little biased when I say that our Thanksgiving dinner was something special, but it really felt like it was. In past years, the turkey has been dry, or the cranberry relish tasted a little too much like saccharin, or the mashed potatoes got heavy whipping cream instead of whole milk (sweet mashed potatoes are just plain gross, trust me). Not the case with our dinner this year. Last night we hit it out of the park. I started the day making bread, and I might have gone a little overboard. I made a loaf of challah bread, braided with sesame seeds; two baguette shaped loaves of classic four ingredient bread (flour, water, salt, yeast); a loaf of sandwich bread for leftover turkey lunch; and cheddar dill biscuits just in case we needed something else savory with dinner. 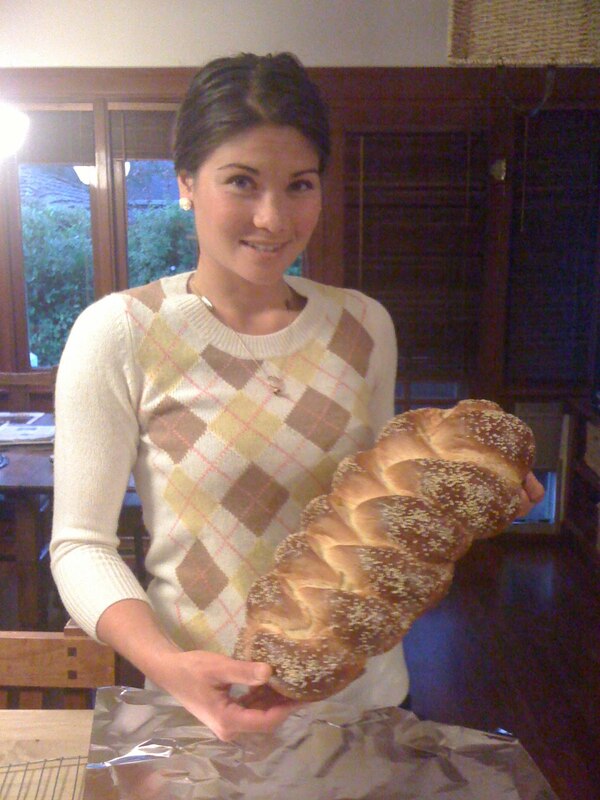 Here I am with the just-braided challah bread, about to brush it with beaten egg whites to produce the shiny crust. The loaf rose tremendously, forcing me to move several racks in the oven to accommodate its height. It turned out just about perfect, and what remained after dinner we used for eggy cinnamon french toast this morning. I also made some macaroni and cheese from scratch, taking Cook’s Illustrated advice that evaporated milk holds the macaroni together much better than regular milk. 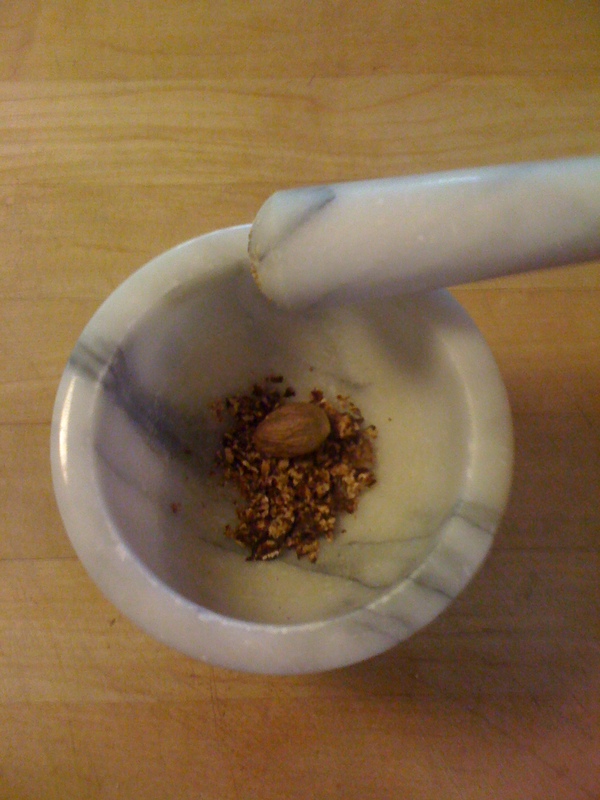 Instead of using massive amounts of extra sharp cheddar for flavor, I opted for fresh ground nutmeg (see the mortar and pestle below), Tabasco sauce, gruyere and monterey jack cheese to accent the cheddar. It was a hit. Trevor asked if it would be weird for him to put the mac and cheese in his leftover turkey sandwich. Flattered, I said no, it wouldn’t be weird. The Goodrich’s brought the turkey, brined first and then roasted with mango pits in the cavity for a unique aromatic touch. Coupled with my mother’s exquisite not-too-sweet cranberry relish, the usually plain turkey transformed into a moist, slightly fruit-flavored delight. There seemed to be no shortage of wine, nor laughter, as we enjoyed creamed succotash, mashed potatoes with chives and cheddar dill biscuits with butter. 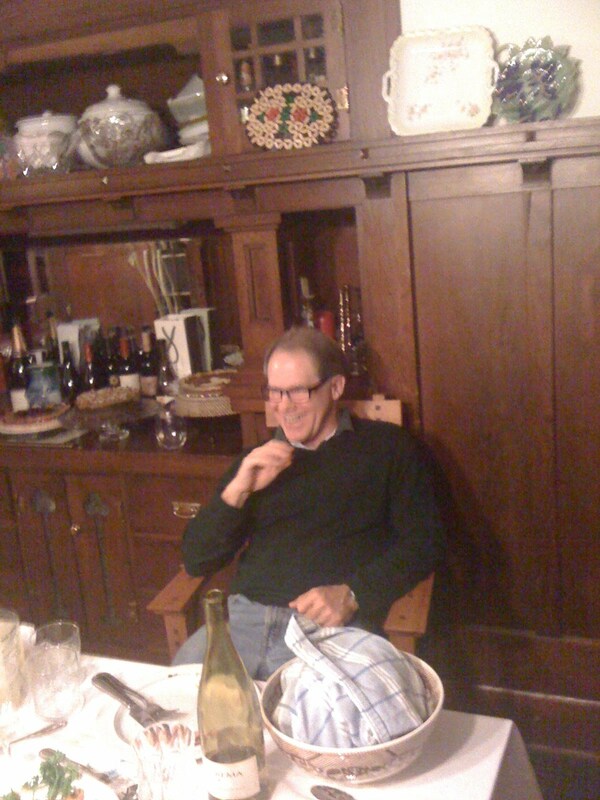 Eric told us of his travels to Peru and Italy, while Trevor explained the banalities of corporate life at his law firm. Elizabeth and I tried to outdo each other with gravy servings, and my dad did his best impression of Grandpa Earl, holding court in our wood-paneled dining room. The photo, slightly out of focus, is an accurate representation of my vision at the time. Though everyone was completely stuffed (BUSUG NA! 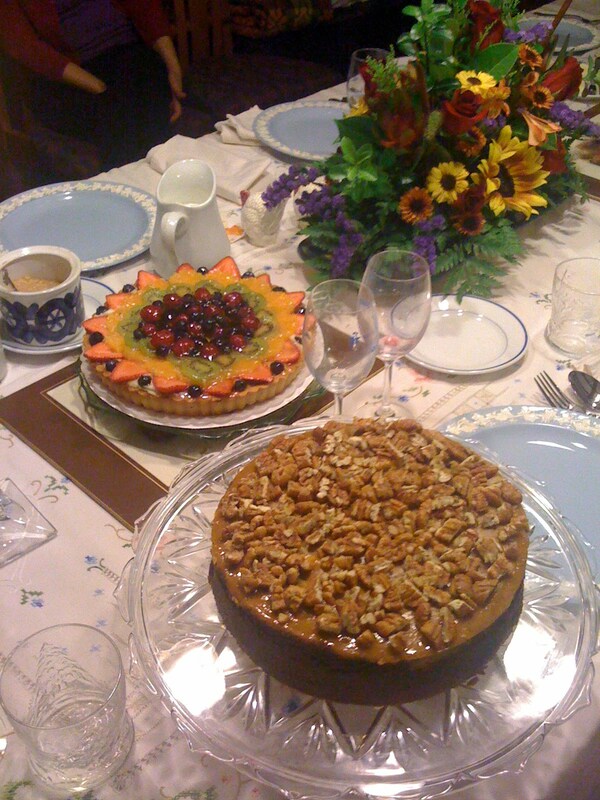 ), we soldiered on through dessert, a delightful assortment of fresh creme chantilly, a fruit tart from Douce France, Racki’s pumpkin cheesecake with gingersnap crust, and pumpkin pie that had never even heard of canned pumpkin. Did we need dessert? No. Was it too much, almost painful to eat? Yes. Did we do it anyway? You can bet your bottom dollar we did. While my waistline would suffer remarkable growth if we were to eat like this all the time (no telling how much butter goes in those mashed potatoes, or the number of eggs in the cheesecake), I would be a very happy person. What a wonderful holiday Thanksgiving is. 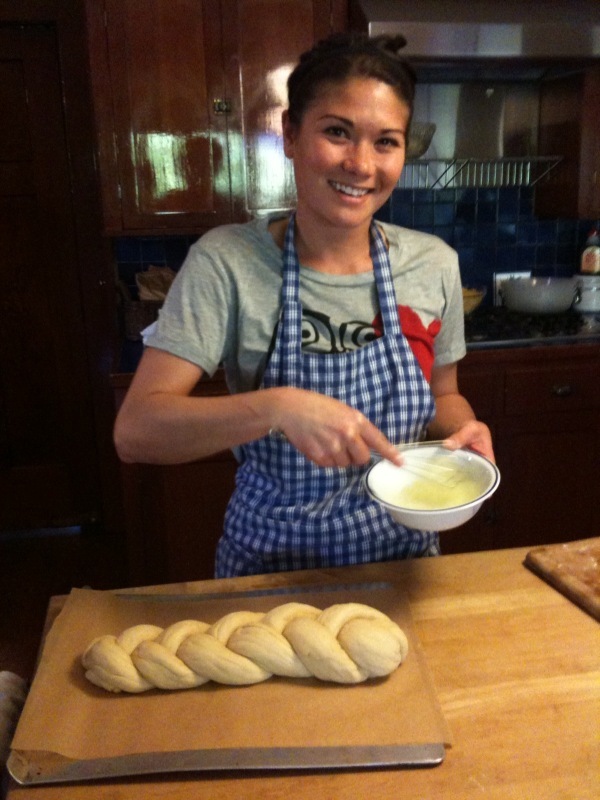 This entry was posted on November 27, 2009 by Ruthie in Uncategorized.